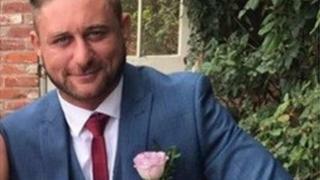 A father-of-two died after being attacked on his doorstep by a driver angry at a "minor" crash between the pair, a jury has been told. Stephen Walsh "clipped" Oliver Brown's van on his way home from a christening in July, Nottingham Crown Court heard. Mr Brown was "determined" to find the person responsible for the crash and spotted Mr Walsh's Lexus on his drive. The defendant, who denies manslaughter, hit Mr Walsh and he was found dead the next morning, it is claimed. The jury heard the small amount of damage on his van had left Mr Brown "pumped up and angry". He had been "circling the area" following the crash at about 22:00 on 29 July before spotting Mr Walsh's car in nearby Blenheim Avenue, in Mapperley, Nottingham. A jury was told Mr Walsh had settled down to watch an episode of Love Island when there was a knock at the door. Mr Brown, 21, is alleged to have hit Mr Walsh hard in the face following a brief argument, and the 37-year-old cracked his head on the ground. Opening the prosecution, Sarah Knight said Mr Walsh sustained fractures to his skull and jaw, leading to "a bleed on the brain that would kill him just a few hours later". Ms Knight added Mr Walsh's fiancée Katie Brown, who had failed to realise he was badly hurt due to the amount of alcohol he had drunk, rang 999 after finding him "stone cold" the following morning. Ms Knight said: "He [Mr Brown] tried to make amends by picking up Stephen Walsh under his arms and dragging him into the living room inside his home and parking him there on the sofa." Mr Brown, of Golden Sands Caravan Park, Ingoldmells, Lincolnshire, denies manslaughter. His girlfriend, Rosann Newton, 21, of Findern Green, Nottingham, denies assisting an offender after allegedly giving false statements to police and deleting text messages from her mobile. The prosecution claim Ms Newton told police Mr Walsh's fiancée had been the one "lashing out" at her partner, punching him to the stomach and head.